Depending upon the botanical authority consulted, a genus of up to 480 species of perennials and annuals from the temperate regions of the northern hemisphere and across the equator (in South America) to Tierra de Fuego. They are mainly mat or hummock-forming evergreen perennials, but some are also clump-forming and deciduous. The leaves usually form rosettes and vary from simple to deeply lobed. The flowers are five-petalled and are solitary or sometimes borne in small to large panicles. 1. Ciliatae (syn. Hirculus) Mat-forming perennials with simple, deciduous leaves and usually small panicles of yellow to orange flowers. Generally not of great horticultural importance and not too easy to cultivate, requiring moist, acid soil and cool conditions. 2. Cymbalaria Tufted annuals with more or less ivy-shaped leaves and panicles of starry yellow flowers. Easily grown and modestly pretty, thriving in moist but well drained soil and partial shade. 3. Merkianae Two species of Arctic perennials rarely grown and very difficult to please. 4. Micranthes (syn. Boraphila) Tufted to clump-forming perennials with mainly basal leaves which are relatively large. Flowers white, sometimes red-spotted, in erect panicles. Cold climate plants needing moist peaty soil. Not easy to grow and not particularly decorative. 5. Irregulares (syn. Diptera) Tufted to clump-forming perennials generally with palmate basal leaves. Some species produce long, thread-like stolons. Flowers white, having one or two petals up to three or four times as long as the others. Fairly easily grown in humus rich soil and partial shade, some species very decorative in either leaf, flower or both. 6. Heterisia This contains one species only, S. mertensiana, q.v. 7. Porphyrion (including Kabschia and Oppositifolia) Usually densely mat or cushion-forming with simple evergreen leaves and comparatively large flowers carried in small panicles or solitarily. They are true alpines and many are desirable garden plants, requiring gritty but not dry soil and a fair amount of sun to flower well. 8. 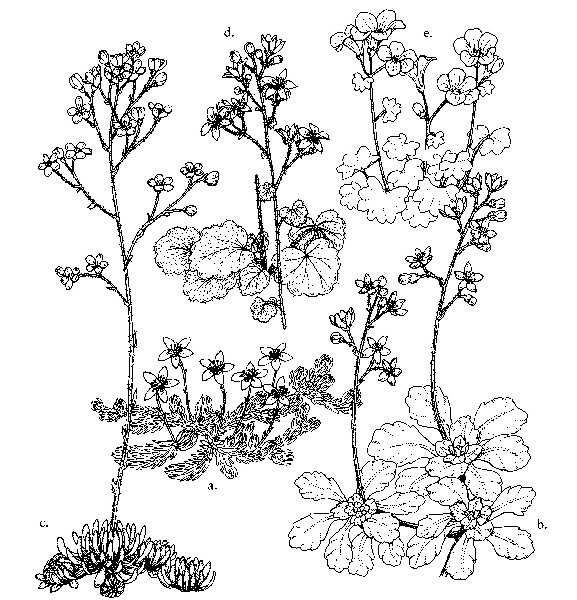 Ligulatae Commonly known as encrusted saxifrages, owing to the white limey deposits secreted by glands on the margins of the simple, evergreen leaves. 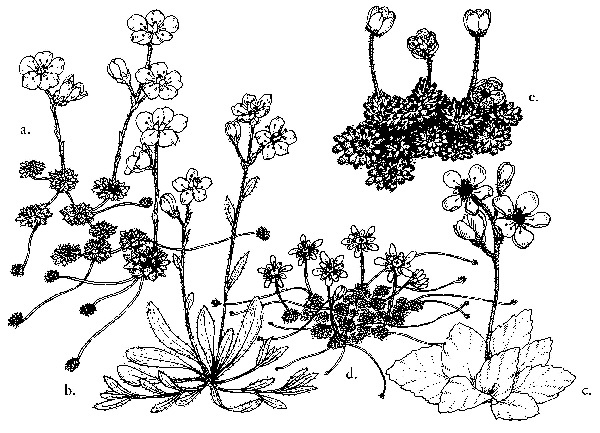 All species are rosette-forming which in turn often make up tufts, clumps or mats. The generally white flowers are carried in conspicuous panicles which in a few species are very large. All species are alpine to subalpine in rocky places, often in partial or almost full shade. Easily grown in well drained but not dry, ideally alkaline soil. 9. Xanthizoon This contains one species only, S. aizoides, q.v. 10. Trachyphyllum A few small mat-forming species with entire, evergreen, bristly-margined leaves and smallish white or yellow flowers on short stems. 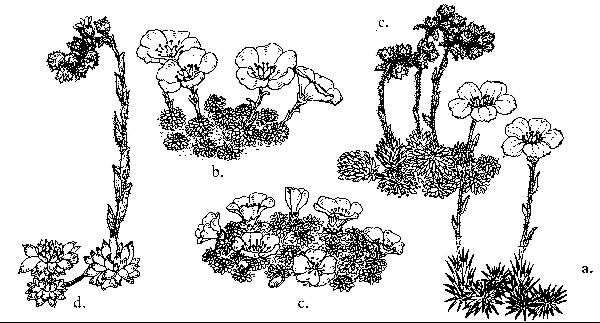 They are montane to alpine, growing on rock surfaces. They need moist but well drained acid to neutral soil and a fair amount of sun, but are not especially decorative. 11. Gymnospora The four species in this section are all variations on a theme of London Pride, having leathery, rich green, rounded to spathulate leaves and airy panicles of small white or pink-tinted, sometimes red or yellow spotted flowers. They are shade lovers from lower mountain slopes. Very easily in most soils and tolerating a lot of shade though blooming best with half-day sun. 12. Cotylea Four species typified by S. rotundifolia, q.v. 13. Odontophyllae This contains one species only, S. odontophylla, q.v. 14. Mesogyne A few small species typified by S. sibirica, q.v. 15. 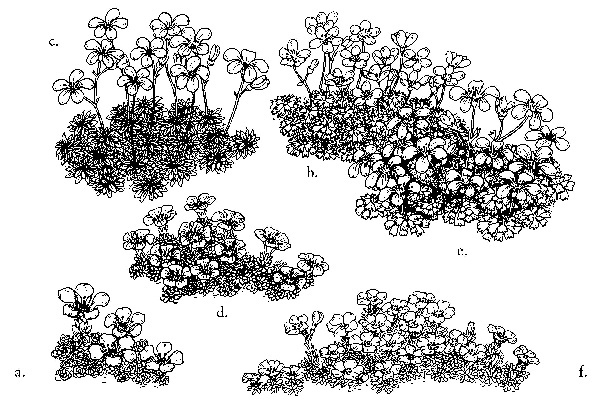 Saxifraga A large section containing annuals and mat or cushion-forming perennials, including all the so-called mossy species. They often have lobed or fingered leaves. The flowers may be tiny or comparatively large, from white and cream to pink and red, in small panicles. Mainly mountain plants and often alpine. Easily grown in moist but well drained soil and best in partial shade.